Engaging students in science, math, and technology are the most important factors in creating tomorrow's leaders.Courtyard Classrooms is a program, sponsored by the Hilton PSO & the Brecksville-Broadview Hts. School District that addresses this issue. We all know you can only learn so much through the teachings of a book; it’s through hands-on activities that students will really learn and retain the knowledge of what they have been taught. In our outdoor classrooms, learning comes alive for our students. They will have the opportunity to watch a tadpole turn into a frog, forecast weather in their weather stations, create an edible root garden and pretend to be Monet while painting in our outdoor studio. 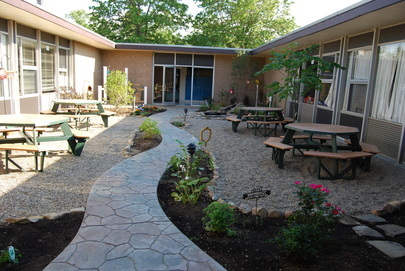 This courtyard is located in the 3rd Grade wing. 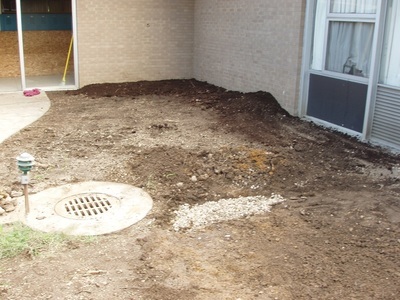 As you can see, this courtyard was not only an eyesore, but also unsafe for our children due to the unlevel walkways and decaying benches. Old tree roots, bad grading and poor draining also created major flooding issues. 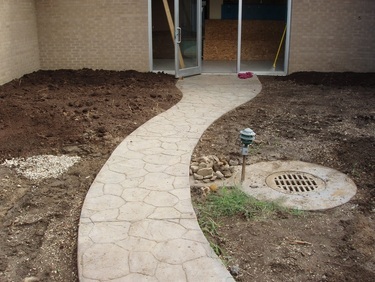 The old courtyard was completely cleared, a new stamped walkway was poured and french drains were installed. Scott Bazan came in to lend his expertise to further enhance the new drainage system and make sure the land was properly graded. Our 1st Courtyard Classroom turned out better than we all imagined! There is seating for over 30 students on our recycled resin tables. Our cultural gardens, inspired by a suggestion made by the Singh Family, are wonderful for teaching our students on so many levels and our birding garden has already brought in Hummingbirds and Cardinals! We stocked our pond with goldfish, tadpoles and frogs. Our weather center, completed just after this picture was taken, has been a great source of learning, for us all!! 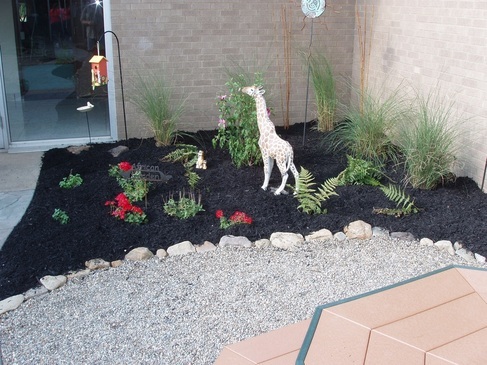 The African Garden is based on the cultures of our students and also the curriculum that is taught. 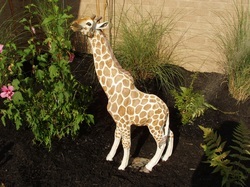 While visiting the garden you may see a Giraffe nibbling on a bush or a family of Meerkats hiding by the Rose of Sharon. The garden also features an authentic African Mask and a Garden Sun. Plants in the Garden - Click on the button below to learn more about the plants in our African Garden. Mr. Giraffe - Ancient cultures in Africa revered the giraffe and commonly depicted it in prehistoric rock and cave paintings. The giraffe is the tallest living animal, uniquely adapted to reach vegetation inaccessible to other herbivores. They have a distinctive walking gait, moving both right legs forward, and then both left. At a gallop they can reach speeds of 35 miles an hour. Did you know that a Giraffes "horns" are actually knobs covered with skin and hair above the eyes that protect the head from injury? 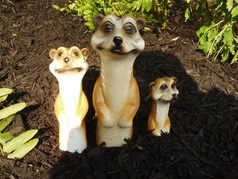 Meerkat Family - Meerkats live in grasslined burrows in the Kalahari Desert and parts of Southern Africa. These burrows are shared with ground squirrels and Yellow Mongoose. Meerkats are very territorial and they will defend their home from other Meerkat gangs. Crazy Fact: They have one toilet area that is used by all members of the gang. "May the happiness this season brings, brighten your life, and hope the year brings you luck and fulfills all your dearest dreams! Happy Deepavail!" 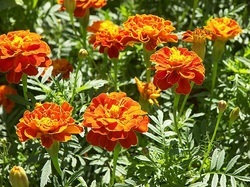 Marygolds - The Marigold Flower holds a great religious significance. The Marigold flower is offered to God and Goddess in India. 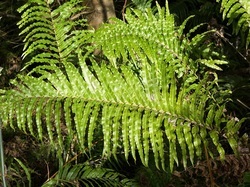 It is also used for making garlands. 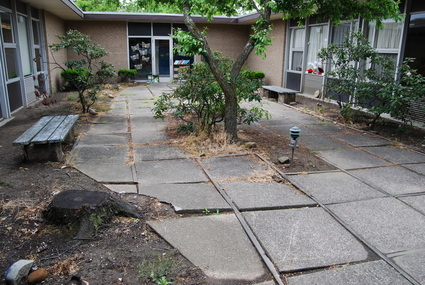 Our Chinese Garden is to the left of the stone path featuring a pagoda and symbols for love and truth. To the right of the stone path is the Irish Garden. The Irish garden will be home to our first Root View Garden Box where the kids will grow their own potatoes! Suzhou Garden in China - In China, gardens were created in the same way as a combination of landscape and paintings together with poems - this was the so-called "poetic garden." In fact there is a saying which goes, “the garden is an artistic recreation of nature; a landscape painting in three dimensions.” Many seek to attain an effect which adhere to Daoist principles of balance & harmony, man & nature. 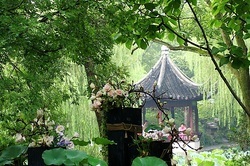 The design of Chinese gardens was to provide aspiritualutopia for one to connect with nature, to come back to one's inner heart, to come back to ancient idealism. Chinese gardens are a spiritual shelter for people, a place they could be far away from their real social lives, and close to the ancient way of life, their true selves, and nature. For some, this was an escape from the frustration and disappointment of the political problems in China. They used plants as symbols. Bamboo was used in every traditional Chinese garden. This is because bamboo represents a strong but resilient character. The chrysanthemum is used to symbolize splendor, luster and "the courage to make sacrifices for a natural life". 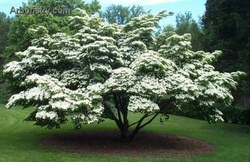 Chinese Garden Plants - Kousa Dogwood is pictured. 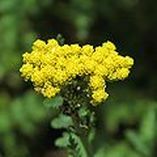 Irish Garden Plants - Yarrow Flower is pictured. Thank you to the Irish Cultural Gardens of Cleveland Board who helped us with our plant selection! 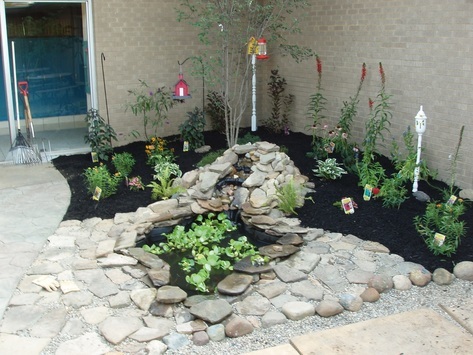 Ponds create a visual and hands-on learning environment for kids. Our students will not only see firsthand how a tadpole turns into a frog but studies also show that ponds help students to understand and appreciate wildlife, their environment and how to protect it. See the images below to learn how the pond was built. Myrtle Martin, Our Turtle - Midland painted turtles are among the most abundant and certainly the most conspicuous turtles in Ohio. They are particularly fond of basking and can be seen by the dozens on logs and along the banks of most bodies of water through the summer. 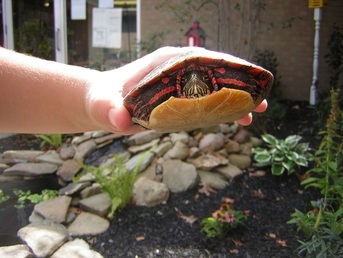 With the coming of winter, midland painted turtles seek deeper water, and burrow into the mud or debris at the bottom. The small amount of oxygen they need is absorbed from the water through the inner lining of the mouth and cloaca. This is where the pond is! Scott Bazan made sure we had proper drainage. 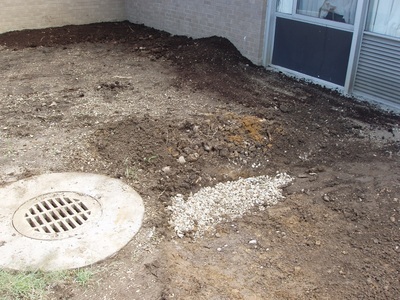 The sewer is still there, it is just hidden under mesh and pea gravel! 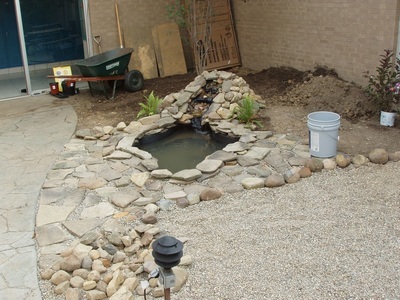 We have a pond thanks to the digging of Mike Urbanowicz and Dave Stanciu! 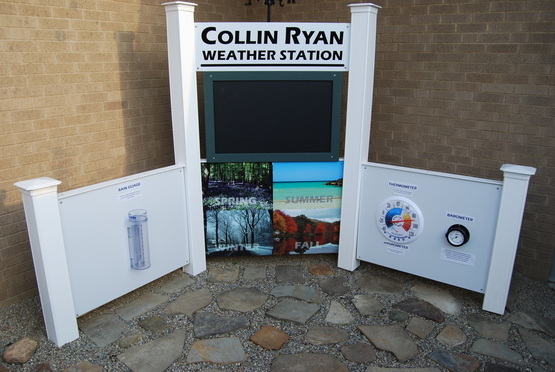 The weather station was built due to the many donations given to honor the memory of Hilton's Kindergarten student, Collin Ryan. Collin loved weather and without a doubt would have loved his weather station! The weather center structure is modeled after a $3000 structure (which was not half as nice as this one) and was made for half its cost. The posts are cemented in and the frame is covered by durable nylon materials, which will keep it low maintenance for years to come. The structure consists of one center board and 2 side boards. The center board features an outdoor blackboard with an aluminum sign and pictures of the 4 seasons. The two smaller side boards hold the weather instruments: Rain Guage, Barometer, Hygrometer and Thermometer. Built by Mike Flis, an amazing Hilton Parent. In addition to the instruments you see attached to the Weather Station, we also have a Weather Vane, Sun Dial, Hand Held Anemometer, Solar System, Snow Measuring Stick and Jumbo Solar Powered Thermometer. Hygrometer - An instrument used for measuring relative humidity. Students will learn the affects of humidity in the air. 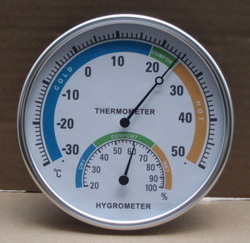 Besides greenhouses and industrial spaces, hygrometers are also used in some saunas, humidors, and museums. In residential settings, hygrometers are used to aid humidity control (too low humidity damages human skin and body, while too high humidity favors growth of mildew and dust mites. What Is Thunder? Thunder is the sound that lightning makes. Sounds simple but why does lightning make a sound. Any sound you hear is made up of vibrations, the vibrations travel through the air as waves until they reach your ear. This means lightning must cause some vibrations. Lightning is a huge discharge of electricity. When lightning strikes huge amounts of electricity shoots through the air, this causes two things to happen. 1. The electricity hits the air and starts it vibrating, anything vibrating causes a sound. 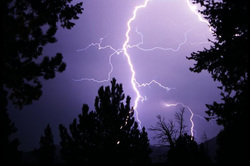 2.The lightning is also very hot and heats up the air around it. Hot air gets bigger: it expands. As lightning is very hot the air gets bigger very quickly and pushes against the air particles starting another vibration. These vibrations are what you are hearing when you hear thunder, the rumbling of thunder is caused by the vibration or sound bouncing of the ground and the clouds. Why is thunder not at the same time as the lightning? We SEE the lightning before we HEAR the thunder because light travels faster than sound. The light from the lightning travels to our eyes much quicker than the sound from the lightning so we hear it later than we see it. As open space disappears, it becomes increasingly necessary to look at our own landscapes as a refuge for biodiversity. Native organisms including plants, mammals, birds, amphibians, and insects create an intricate web of life. This is a wonderful natural orchestration with each species’ life cycle highly dependent on the others. For example: Spring wild flowers are pollinated by and provide nectar to tiny flies. These flies become food for early spring birds. The timing is orchestrated perfectly. It is not a coincidence that the local native plants have seeds and berries ready just when the birds need them. Bird droppings are the best way to get their seed dispersed. Plants and animals that have evolved together depend upon each other for survival. Unfortunately, native plants, a vital part of the natural web of life, are being lost at an alarming rate. 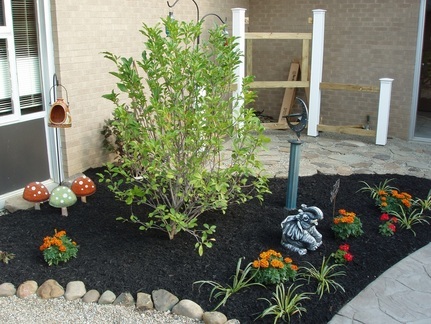 Removing a certain native plant from the landscape will likely remove the insect that feeds on that plant, which in turn may eradicate the bird that feeds on that insect. And this is just a simplified example. The loss of a species can quickly escalate to affect an entire ecosystem. To paraphrase Paul Ehrlich, author of Native Plants: Relationship of Biodiversity to the Function of the Biosphere, removing native species from an ecosystem is like taking rivets out of an airplane wing; it is impossible to know which one will be the last one that was holding the whole thing together. 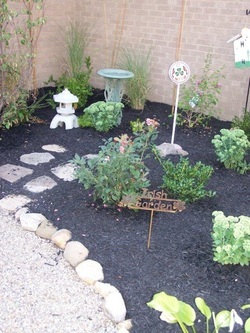 There are real and practical pay-offs to encouraging a more biologically diverse yard. Healthy, balanced ecosystems clean our water and our air. Pollinators are vital to food production. Northeastern Ohio features a variety of habitats ranging from deciduous forests and woodlands to marshes, wetlands, and ponds; as a result, the area supports a rich and diverse population of wild birds. In addition, proximity to Lake Erie makes northeastern Ohio an ideal place to observe migratory birds of all kinds as they return every spring from their winter homes in the tropics to mate and nest in Ohio. Whether you are embarking on an organized bird watching hike at one of Ohio's numerous state parks, or merely curious about the identity of the brightly-colored bird at your backyard feeder, there are observational techniques you can use to identify some common wild birds in northeastern Ohio. 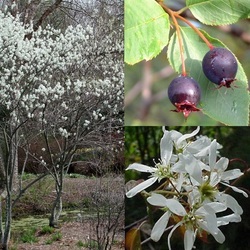 Featured Plant: Serviceberry - Because of its various sizes, it can be considered a bush or a tree. When spring comes, the serviceberry tree greets you with an abundance of showy white flowers, which only last about a week. The flowers are beautiful but not large--only about 1-½ inches across. Then comes summer and the tree starts to grow juicy berries. These begin green and then change to red and finally to a purple-black color when they are fully ripe. The berries are delicious and can be snacked on from the tree or harvested and used to make all types of baked goods or canned into jams and jellies. The Native Americans were growing the serviceberry tree when the settlers arrived on the first ships. The berries taste somewhat like blueberries. Today they are used by some companies who make foods with mixed berries. If you have a serviceberry tree in the backyard, you can give the fruit a try by experimenting with different recipes. Don’t wait too long to harvest your serviceberries. You will undoubtedly want to do it immediately when they ripen, because birds think they are a very tasty treat as well. In fact, if you are a bird lover, you may want to plant some serviceberry trees just to attract birds. They will draw all types of birds, including blue jays, robins, mockingbirds, American goldfinch, cardinals, brown thrashers, and tufted titmice. Featured Bird: Cardinal - The state bird of Ohio, the cardinal remains in the area for the winter, where it forms a vivid contrast against the snow. To further identify a cardinal, listen for its melodic whistle early in the morning, as well as its brusque-sounding call of "chip!" 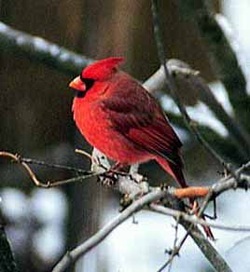 Female cardinals are a streaky brownish-red. A study has shown that northern cardinals eat 51 kinds of beetles, four types of grasshoppers, termites, ants, flies, dragonflies and 12 kinds of homoptera which includes leaf hoppers, cicadas and aphids. Cardinals are non-migratory birds that are attracted to bird houses and feeders especially those with a great supply of food. Thank you.. thank you ... thank you, to all our wonderful donors and volunteers! Without you, this never would have been possible. Build a fully functional Weather Station with your kids, and then teach them how to use the instruments. Use your readings to track the weather. Then try to make predictions. Click the button for complete instructions.